Daniel Hale Williams Society Steering Committee members Quentin Youmans, MD, Chief Medical Resident and 2015 FSM graduate, Clyde Yancy, MD, vice dean for Diversity and Inclusion, and John Franklin, MD, associate dean for diversity, inclusion and student support, welcome the class of 2022 at a picnic hosted by the Office of Diversity and Inclusion. 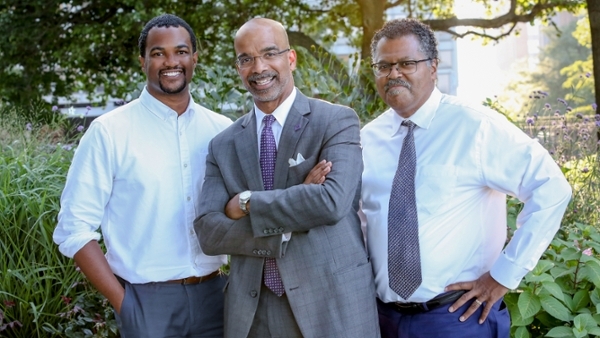 The Daniel Hale Williams Society of the Feinberg School of Medicine was created in 2018 to address the need to focus on the recruitment of African-American males into the medical profession. A recent report from the American Association of Medical Colleges indicates that numbers of African American males in medicine have been stagnant for the past 40 years. According to the report, Altering the Course, Black Males in Medicine, in 1978, 1,410 black men applied to U.S. medical schools and in 2014, that number was 1,337. Findings of the report also show that in 1978, there were 542 black male matriculants to MD-granting institutions. In 2014, that number was 515. To address this critical concern, the Daniel Hale Williams Society has launched several initiatives to promote and facilitate African American male career development and matriculation to medical school. The Society's Board Members are prominent campus leaders who proactively identify promising students at the undergraduate level, provide career mentorship and guidance, and encourage applications to Feinberg. The Society hosts interviews, campus tours, and revisits to campus and also provides scholarship support for promising medical students. If you are interested in learning more about the Daniel Hale Williams Society please contact us at diversitymed@northwestern.edu. Admissions-specific questions may also be sent to med-admissions@northwestern.edu. Daniel Hale Williams, MD, was Feinberg's first African-American graduate and faculty member, and one of the most noteworthy physicians of the 20th century. He was the first black fellow of the American College of Surgeons and the principal founder of the National Medical Association. Williams founded Provident Hospital in Chicago, the first black-owned and -operated interracial hospital in the country in 1891. He performed one of the world's first successful heart operations in 1893, and was appointed surgeon-in-chief at Freedman's Hospital, Washington, D.C., in 1894 by President Grover Cleveland.